Panini has once again crossed over a brand from one sport to another. Playbook, which has traditionally been a football product, has now come into the hockey world. Collectors will be treated to one booklet card per pack/box of Playbook. Let's take a look at what a box of the new Playbook hockey will bring us. The Playbook base card is a thick, premium feeling piece of cardboard. The style of overall look of it reminds me a lot of Panini Prime - there is a familiar font and serial numbering that instantly makes me think of that particular product. Overall the base card is well done with bright and bold graphics. The card has the team logo implemented in a large way in the background. The Playbook logo sits in the upper corner along with the serial number to 249. 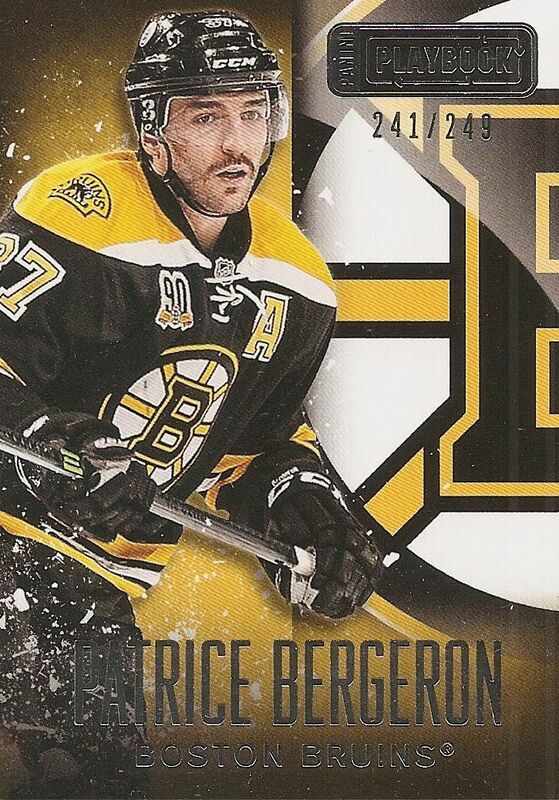 The player's name and team are prominently foil stamped at the bottom of the card. The base cards are a mix of fun and premium. I find it interesting that Panini went for this look as it is a departure of sorts from the more 'classy/minimalist' designs for products such as these. The back of the card card mixes some traditional Panini elements with some strong graphical ones. These backs are definitely more involved than some of the traditional backs I've seen from Panini. The back matches the front very well. I enjoy how the team colors continue to be a big part of the back's design. The player photo has been done in black and white - I thought that was a pretty artsy touch by the designers. Good job there! As for the stats, there is just one line done in the standard Panini way. Seasoned collectors of Panini products may notice that the stats portion of the card shares many similarities to other Panini product lines. The regular set rookie cards are in booklet form. And that makes sense for a product with the name of Playbook. It's what sets these cards apart from the others. These cards feature a couple large pieces of event-worn cloth along with an on-acetate autograph. The card has a simple, geometric-pattern type design to it with a silhouette of the player on the left-hand portion of the card. 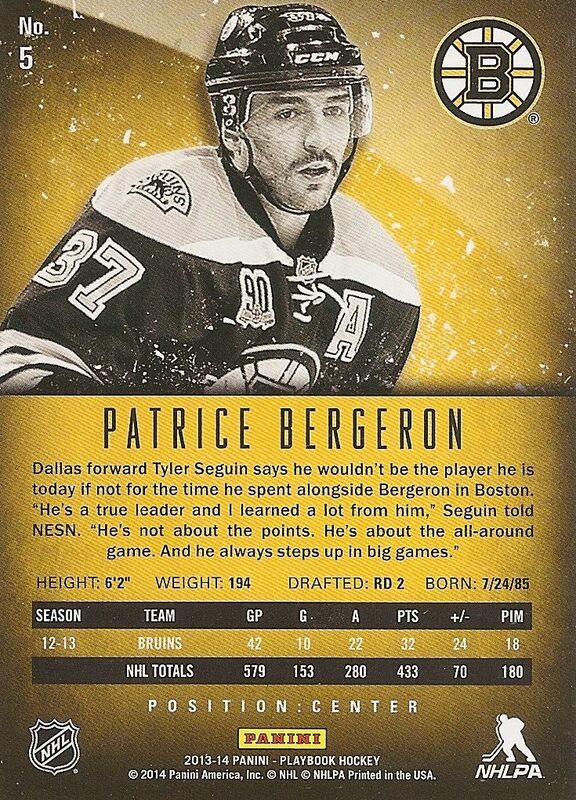 I like the look of these cards, but the plain jersey swatches just don't do it for me. These large areas make me yearn for some crazy tangled patches. And those cards are out there, they are just in a different, much more limited, parallel variation. As for the 'cover' of the book? It's just white and gray. Book 'covers' have tended to be rather boring in nature... and these books don't do anything to alter that. Rookie booklets are numbered to 199. I thought it was interesting that Panini went for the one big brick pack instead of what they did with football. In football, collectors got to open a few one-card packs. I thought it was sort of a waste of materials, but it made for a more prolonged opening experience. These Playbook packs will typically give collectors one base card, another hit, and a book. 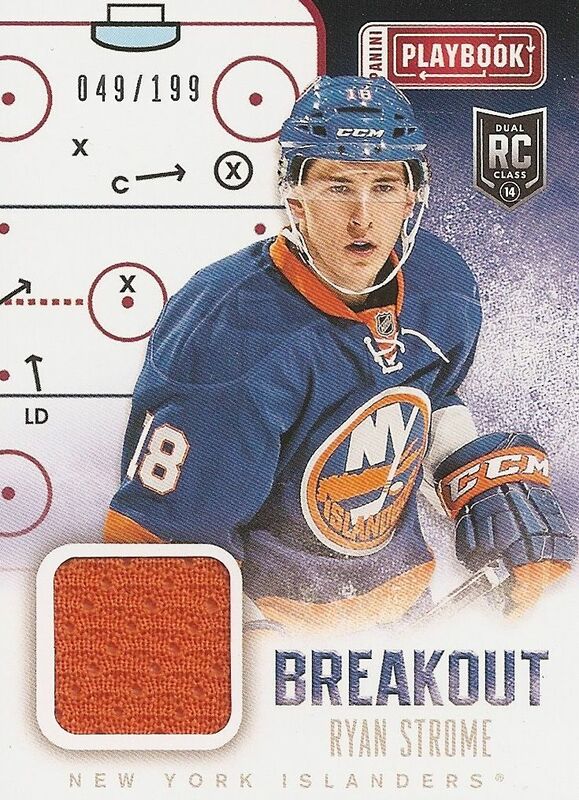 Since my booklet was a rookie card, the only hit I got from the pack/box was this Breakout event-worn jersey card of Ryan Strome. The Breakout design is, like the base card, nice and bold and bright. These jersey cards are serial numbered to 199 and contain a relatively small piece of jersey. It's a card that you probably won't think too much about after you pulled it. With only three cards per pack, collectors will not be able to get a good sample of Playbook in a single box. For me, I was glad that my booklet card was the autograph. I personally feel that booklets need to cram as much goodness in them as possible to make the extra effort in making them worthwhile. And I know that there are Playbook booklets out there that are definitely not really worthwhile. I definitely have mixed feelings about this as it looks like booklets will be the next big thing to be the next fading trend... and fast. 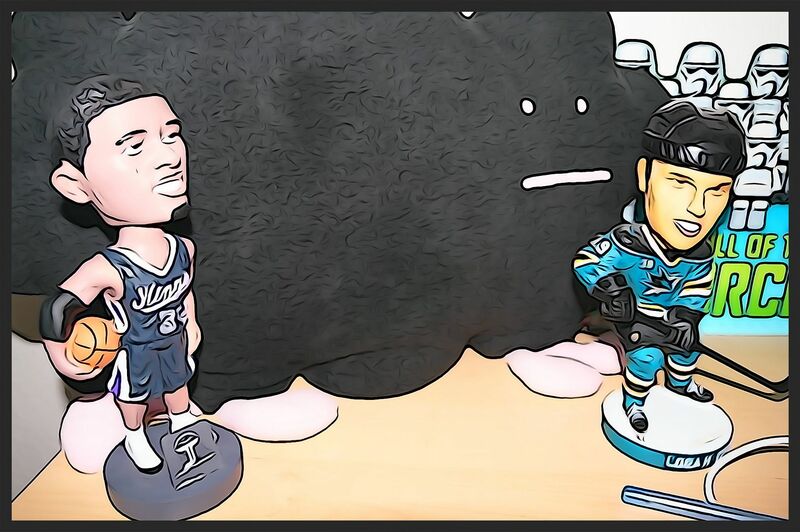 Panini Playbook hockey is an intriguing product. If compared to football, it is a steal! The price of the box is about a hundred dollars less. But when you look closely at the product, there are things that collectors need to be wary of. First, there are typically only three cards per pack, though I've seen some breaks with four. 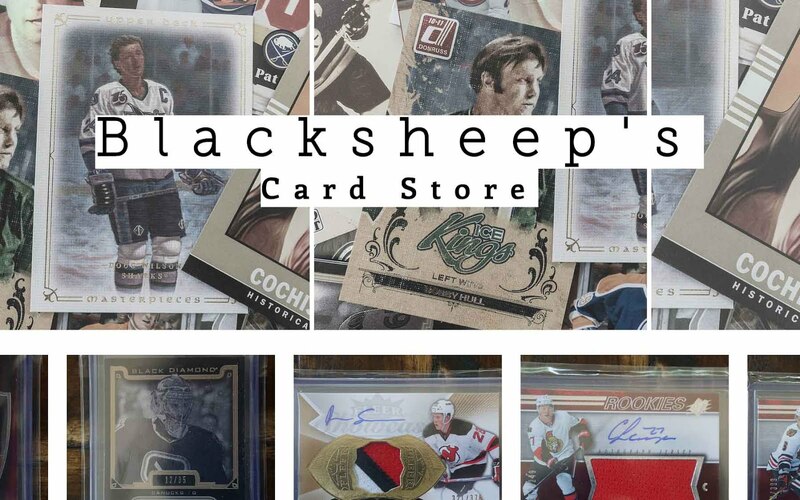 For collectors wanting some awesome booklets... well... they are there in Playbook, but more often there are unnumbered booklets with just jersey pieces in them. And I know those are not the kind of booklets that collectors want. My box budget is about $100/box. So Playbook fits into that rather nicely, but it will not give you a long and satisfying break. It's a hit or miss break that will end very quickly. So overall, Playbook is a product that you need to think long and hard about before jumping into. If you're a collector willing to take the risk and jump in... then go for it! If you're looking for a product to be able to slowly collect and enjoy, this might be one to avoid. Check out my break of Playbook from D&P Cards in Sacramento, Ca. below! Great Break! That Maata will have a heat re-sale value! Awesome break! The booklet goes for a bit! Great product!!! Love the book!! Always love booklet cards, these look nice and clean. Great review. Where is the mandatory Mrazek? Is this a fake video? But seriously I think that this is a scary product, only 3 cards usually so huge hit or miss potential. Määttä again is a great pull. 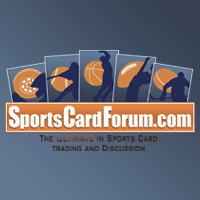 Awesome product, but in my opinion the overall value of book cards will go down significantly. Great break! I was thinking about getting this box and you really helped me decide that I should get it. You're breaks are the best beacause you actually take the time to write a whole review afterwards. I love people who do that on youtube. Playbook is nice set and nice new set for hockey collecting. Those booklets look sick and nice Määttä for you. I guess this is Panini's swan song in the hockey market! They sure know how to end on a high-note! I need a Strome and Maatta to add in my collection. The cards you get are biased. Overall, I think the value is okay. Was definitely happy with it. + You can pull some great booklets out of thia product. - You get only three cards per pack, which both gives a very short opening as well as you have to pull a good autograph to make up fot the box price. Nice cards! i'm really on the fence about playbook it seems super hit or miss! Nice break great break. It was Olli a Maata of time before you opened playbook! Love this product! I like the design. Very creative but I do think panini should have put more packs in the product even since they do not have a loscence next year. They should have gone bigger with it. Thanks for the giveaway blacksheep! Never was a Huge fan of the books, but these aren't too bad. I really like how some of the books have the jersey spell out certain things. Pretty cool product I just hope it doesn't ruin the prices of booklets.